One of the major factors in the price of a stove is not how clean or efficient it is, but how big it is and whether it is sold through a specialty retailer or a big box chain. 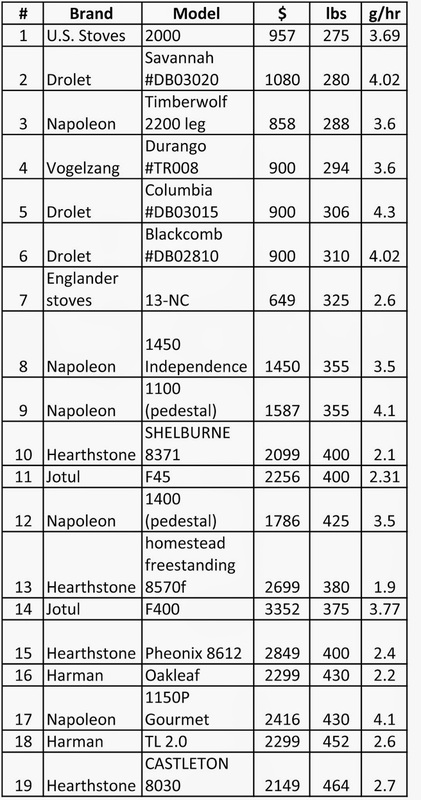 We looked at a sample of 19 smaller stoves from 8 different brands, with firebox sizes ranging from 1.7 to 2.25 cubic feet and calculated the correlation between stove weight, emissions rate and market price. The result was a moderate positive correlation between weight and price but only a small correlation between emissions and price. 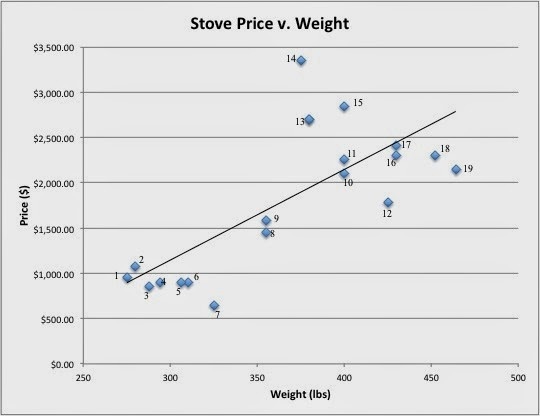 We did a scatter plot of both stove weight in pounds and their market price and found a clear upward sloping trend. The calculated Pearson correlation comes to R=. 6691. The relationship between a stove’s emission rate and their market price is only slight for smaller stoves. All other things being equal, stove experts say heavier stoves tend to be more durable; weight can be one of many factors in deciding which stove to buy, and whether it is a good “deal.” Stoves with 1.7 to 2.2 cubic fireboxes typically weigh between 275 and 475 pounds. The lighter stoves (275 – 325 lbs) tend to cost less than $1,000. Heavier stoves (350 – 450 lbs) have a greater price range, with a few under $2,000 but most between $2,000 and $3,500. Cast iron stoves tend to be both heavier and more expensive. Over 100 years ago, weight was for a brief time, the way stoves were priced, according to an excellent chapter on stove history by Professor Howell Harris. The industry association at that time was the National Association of Stove Manufacturers (NASM), founded in 1872. One of the leaders of the NASM was John Strong Perry, who ran the second largest stove company in the nation, which later became US Stove and is still one of the largest stove companies in the country. Perry believed in information and quantitative data, and one way it was put to use was in an informal system of price fixing. Perry argued that the industry needed to charge no less than 6 cents per pound of stove and the NASM enthusiastically adopted that proposal. Perry’s company was a leader in the production of low cost, lighter weight stoves, as it still is today. Back then, Perry used cheap labor from Sing Sing prison to make stoves. When his competition got a law banning such prison labor, in 1866 Perry relocated production to the low-wage, nonunion south and experimented with using “colored” labor, according to Professor Harris. Today, US Stove is still based in Tennessee with production there, in Alabama, Oregon and China. The first half of an 8-minute promo video from US Stove delivers a polished story of their history. The use of weight to determine the price of stoves did not last long, but NASM remained relevant and active also because its member companies needed a voice to lobby on federal policies impacting their industry. By the First World War, the industry was in rapid decline as electrification and oil heat took over. NASM membership collapsed and the NASM held its last recorded meeting in 1929. According to Prof. Harris, who wrote the exhaustive study of the US stove industry in the 1800s, the primary purpose of NASM was price fixing, and secondarily was improvement of manufacturing and business methods. Innovation, says Prof. Harris, was not on the agenda of the NASM. Key to numbers in the above chart on weight and price comparison. Howell Harris (2012). Coping with Competition: Cooperation and Collusion in the US Stove Industry, c.1870–1930. Business History Review, 86, pp 657-692. doi:10.1017/S0007680512001808.